Rhodophyta yellow besides red algae? 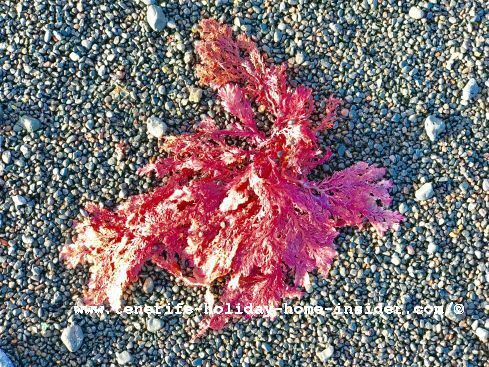 Rhodophyta Red Algae Seaweed was in the majority on one of the three Tenerife beaches of Playa Jardin in Puerto de La Cruz in late Spring. That was on a sunny morning on March 21 of 2019. Previous tidal waves had scattered a few of the Rodófitos, as called in Spain, on the seashore of beach Playa Charcon which was rather serene on that day. Some of the seaweeds on the almost black volcanic sand and very fine gravel by the Atlantic ocean also showed hues of purple, pink, white and dark brown. In fact, some almost brown species of similar Rhodophyta or Rodófitos simply didn't stand out prominently on the dark sand. They were not worth to be caught on camera at the time. However, a gold colored one as depicted beside, was not to be missed. 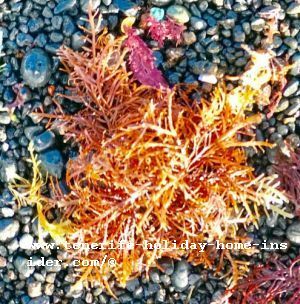 The color had such an attractive orange gold appearance under the sun that it should be listed as part of the beautiful seaweeds of Rodofitos, although nothing seems to be about it in the Internet. This was not the case, as algal blooms mean a total swamp i.e. an inundation of seaweed that may be washed onto a beach. Only on some rare occasions, some major green deposits have been noted on Playa Jardin. However, it was seldom in menacing quantity which also may suffocate sea life in the ocean when it occurs. The latter is usually due to human influence when pesticides may change its eco system and delicate natural marine balance. 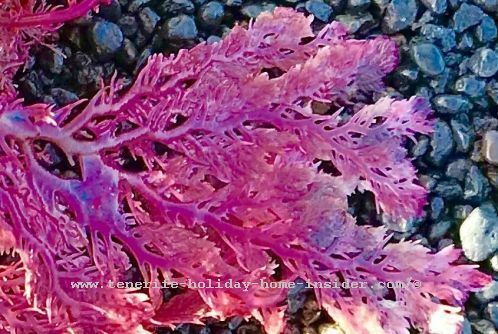 Origin of this mostly red seaweed Rhodophyta? That's an interesting question besides algae being millions of years old. Mind the shores of the more tropical Morocco of its African West Coast where the red seaweed is part of an industry are hardly 500km away. However, only fragile, black Algae thrive around the Canary Islands from a depth of 20m downward, where no photosynthesis is needed. Not even the nearby Golf stream helps red Algae to grow near Tenerife. 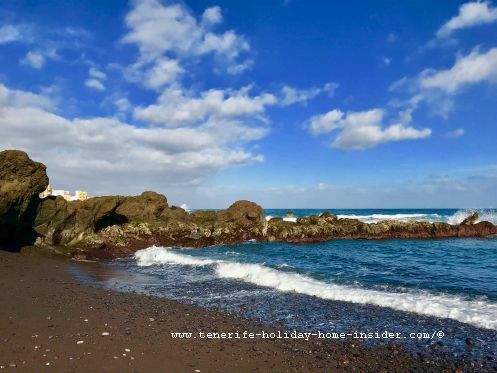 Needless to say, the Tenerife holiday home insider isn't an expert in the matter. However, she was very curious as her family likes to use specific algae as part of Vegan food. Also not to forget is the natural Iodite content in Algae capsules which she uses regularly as a supplement to improve the function of her thyroid glands. This is instead of using cooking salt. By the way, the algae capsules can be bought online. This type of Red Algae of the category macroalgae is also beneficial to humans in other aspects. Its antioxidant properties boost the immune system, help digestion and healthy sleep. Therefore, its vitamis and polyansaturated fatty acyds and gels are used in the food production. also mentioned important health benefits like vitamins and calcium. He also talked about the component Agar of rodofitos that is used for emulsifiers and cosmetics.